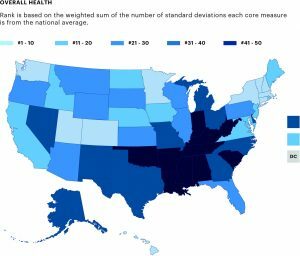 The least healthy states are all in the south. The bottom five are in descending order to unhealthiest: Arkansas, Oklahoma, Alabama, Mississippi and Louisiana. Where are the healthiest states? Hawaii, Massachusetts, Connecticut, Vermont and Utah. What are Georgia’s health strengths? The state’s rate of children in poverty fell to 21 percent, down from 22.9 percent last year. The national rate of children in poverty is 18.4 percent. Georgia has increased its number of primary care physicians. Georgia has 121.9 primary care doctors for every 100,000 individuals. This is a 2 percent increase from last year. Nationally, the number of primary care doctors has increased 5 percent. In Georgia, there are 130.2 mental health providers for every 100,000 individuals. This is up 6% from past year. Nationally, the number of mental health providers has increased 8 percent. Georgia’s number of immunized children is high; violent crime deaths are down; and even adolescent drinking is down. Researchers at Mayo Clinic and the University of Minnesota have announced that they are on the brink of a major cancer treatment breakthrough that could revolutionize treatment for the deadly disease. The federal government is soon expected to approve these evolutionary new cellular therapies that will specifically be used in the treatment of rare forms of blood cancer. According to the researchers, over a period of time, they expect the therapy to be approved for the treatment of other cancers as well. The treatment involves extraction of the patient’s white blood cells, and putting these through a process of genetic engineering in a lab. These genetically modified cancer-fighting cells are then placed back in the patient’s body to fight cancer cells. The researchers found that patients’ recovery patterns were enhanced by about seven times when they were put through the stem cell therapy as opposed to to traditional chemotherapy. Patients who benefited from the treatment found that their cancers disappeared. If the federal government goes ahead with the approval, it would mean the first approval of a genetically modified treatment for cancer. If all goes well, this kind of genetically modified treatment could be a substitute for the toxic chemotherapy that most cancer patients dread. Rheumatoid arthritis is a painful condition and many victims who suffer from this debilitating disease apply for Social Security disability benefits every year. A person who suffers from rheumatoid arthritis may suffer from pain, severe inflammation, and stiffness in the joints combined with excessive fatigue. There are also several complications associated with rheumatoid arthritis, including osteoporosis, dry eyes, infections, carpal tunnel syndrome, and even cardiac disease. These complications make it extremely difficult for a person to work and earn a sustainable income. A new study finds that eating more fish can help relieve some of the painful symptoms associated with rheumatoid arthritis. The results of the study were published recently in the journal Arthritis and Rheumatology. Researchers were specifically looking at how increasing fish consumption could reduce activity of the disease. Stroke treatments in the future could be significantly better than they are now, thanks to research that has found a new way to safely remove clots in patients. Doctors currently treat stroke by using an infusion which removes the blood clots by dissolving them. However, patients who are given this treatment stand a risk of swelling in the brain and excessive bleeding. In addition, patients must receive the infusion within three hours of suffering the stroke for the treatment to be effective. However, researchers at the Joslin Diabetes Center in Boston are using a drug combination that will potentially improve outcomes for stroke patients. The researchers conducted tests on mice, and found that when the mice were given the new treatment, there was a drop in bleeding levels, lowered swelling in the brain, and limited brain damage, compared to animals that were not given the treatment.